I am finally entering the new age of video- boy, you just wait until I get my new camera and tripod all set up.....you'll be sick of seeing me telling ya what to do! And don't forget to check out my youtube channel from time to time. "Every year the call goes out for the best homemade Halloween outfits comic fans can muster. Here's this year's top entries." Woot! Check out the teeny tiny picture of me as Queen Etherea (don't forget to check out the other entry of how I made it, more photos too). 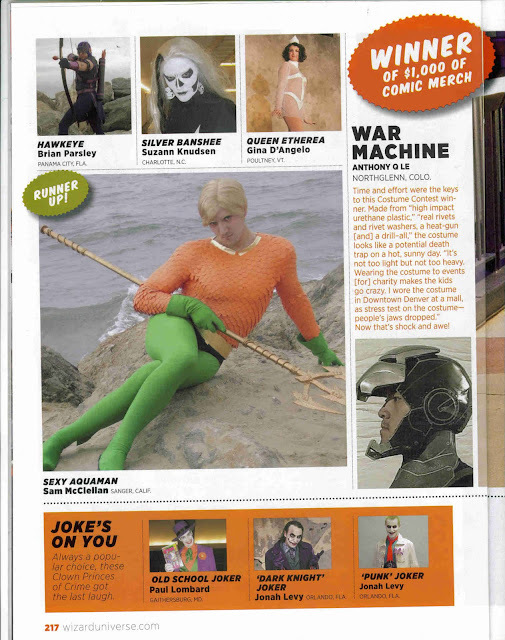 While it's difficult to compete with War Machine (winner- or any costume that is held together with more bolts than thread) it is nice to be included! See you next year Wizard- I've got some big ideas in the works!! Geez- I can't believe it's October already!! Both hurray (I'm special) and boo-hoo (getting older) for my upcoming birthday. Spent the first Saturday of this month at the Sheep & Wool Festival about 90 minute drive.